The account specified when adding a Veeam backup server (see Adding Veeam Backup Servers). The account under which the Veeam Enterprise Manager Service runs, for example, if you have upgraded your Enterprise Manager (with backup servers connections preserved). The account used to interact with the backup server must have Veeam Backup Administrator role permissions on the backup server side. This is because on the Veeam backup server side all operations are performed by Veeam Backup Service that verifies beforehand if the account that is used to interact with the backup server has rights to accomplish the necessary actions. 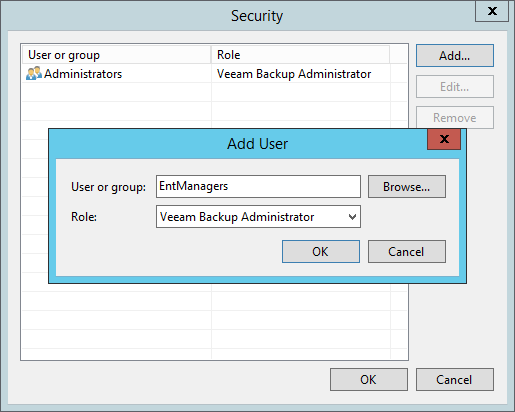 Log on to the Veeam backup server as a user with Veeam Backup Administrator role permissions. Select Users and Roles from the main menu of Veeam Backup & Replication. In the User name field, specify the account that Veeam Backup Enterprise Manager will use to interact with this backup server. Enter the name of a user or group in the DOMAIN\Username format. From the Role list, select the Veeam Backup Administrator role. To edit settings of an added user or group, select it in the list of roles and click Edit on the right. Then edit user or group settings as required. To delete an added user or group, select it in the list and click Remove on the right.